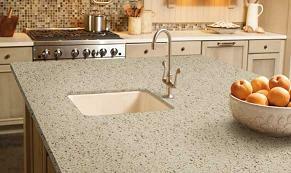 Zodiaq quartz countertops are among the most popular kitchen countertops. Designed exclusively by DuPont, Zodiaq countertops provide the natural beauty of quartz and increased functionality and resistance. Made from 93% quartz, they provide a different depth and light play when compared to other types of quartz countertops. Currently, Zodiaq countertops come in a wide range of colors for you to choose from  actually, there are over 30 different colors ranging from the darkest black to the brightest white. Also, you can go for a wide range of slabs as well  for instance, the thickness of these quartz countertops varies from 2 to 3 cm. These countertops are easy to clean and maintain as well mainly because they come with a great chemical resistance and an extremely durable, non-porous surface. In their case, you will need no sealant or wax in order to keep their original shine and gloss. However, you will have to clean your Zodiaq countertop on a regular basis but this is an easy process as well. All you will have to do is to use a paper towel or damp cloth with a quality non-abrasive cleaner. Remember not to use bleach as this substance may damage the quartz surface and even change its original color and shine. Although such a quartz countertop is extremely and naturally resistant to heat, you will have to avoid placing cooking pots or hot pans right on its surface because this could cause discoloration and warping. Also, when you are cutting foods, make sure that you use the necessary cutting board in order not to damage the surface of the countertop. Once you make a spill on your Zodiaq countertop, you will have to clean this spill as soon as possible in order to avoid staining. When it comes to choosing the right color for your Zodiaq countertop, you should definitely take your time and take full advantage of all the samples that are provided by DuPont. You can get all their samples online and have them printed in order to do the necessary comparing and purchase the chosen color from a local store that sells such countertops. Or you can ask for some samples from a local store that sells these countertops and take these sample home in order to figure out which color is going to match your kitchen décor best. Keep in mind that these Zodiaq quartz countertops are not similar to granite countertops when it comes to the way they look. In fact, these countertops are likely to appear more monotone or duller when compared to granite and this happens mainly because they do not come in so many options and shades as granite countertops. However, they are extremely attractive and they can become the perfect match for every modern kitchen space. Just make sure that you choose the right patterns and shade movement in order to make the best out of your Zodiaq countertop.